OASE BioTec ScreenMatic semi-automated pond filters & optimised filter sets for larger ponds with or without fish and Koi Carp. The newly developed OASE BioTec ScreenMatic Pond Filters are designed to offer superb cleaning in larger ornamental ponds, fish ponds and Koi Carp stocked ponds. The new design ScreenMatic gravity flow-through filters feature an automated porous cleaning belt which will sift out larger debris and deposit this into a collection tray, allowing the filter foams to process the smaller detritus and therefore greatly reducing the frequency of cleaning. 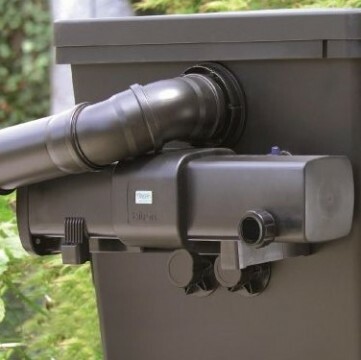 OASE Biotec ScreenMatic Filiters can be supplied alone, or as BioTec ScreenMatic Sets which combine a BioTec ScreenMatic pond filter with a well matched AquaMax Eco pond filter pump and Bitron ultraviolet clarifier for a complete pond filtration system. Supplied individually or as part of BioTec ScreenMatic Sets with pump and UVC. 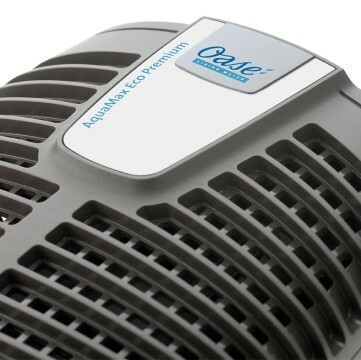 The OASE BioTec ScreenMatic² is an intelligent, flow-through pond filter that provides automated mechanical waste removal and biological filtration. The water enters the filter via a flow spreader onto a 300 micron fabric belt which strains out solid waste particles. 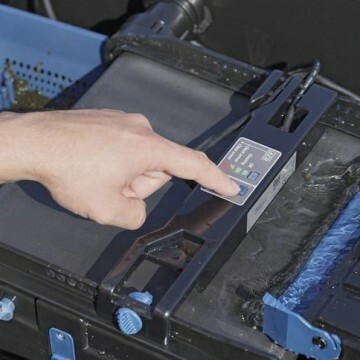 When sufficiently soiled, a sensor engages the motor which performs a cleaning cycle, transferring the accumulated waste into a collection tray below the screen. The control display also allows instant cleaning cycles at the press of a button. The waste sensor can be adjusted backward and forward to alter cleaning regularity based on waste accumulation. A cleaning brush is supplied to keep the fabric screen free of entrapped dirt. After mechanical straining, water enters the the biological media, a series of filter sponges differing in coarseness. The blue foams are rough, violet are medium fine and red are very fine grade. These sponges provide an abundance of surface for aerobic bacteria to populate and breakdown soluble waste pollutants. Cleaning the foams is made easy by the compression handle used to push down on the foams to release any build up of organic waste. Water is then directed through cartridges of granulate media (zeolite) which bind unwanted nutrients and trace ammonia before returning to the pond. 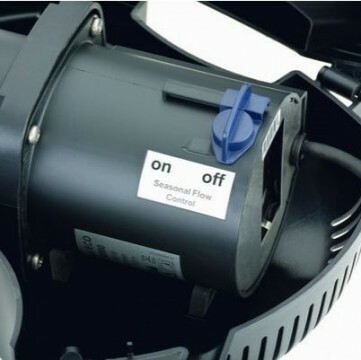 ‘EFC’ Environmental Function Control tells the pump when it is sucking air and shuts it down. The pump then tests for air intake when next turned on. These pumps are guaranteed as standard for 3 years. 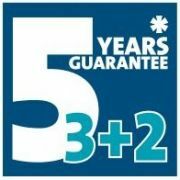 Upon registering your purchase with OASE, an additional 2 years are guaranteed! 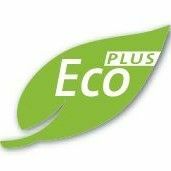 Eco Plus is OASE’s most energy efficient rating, meaning the AquaMax Eco Premium delivers superb performance using minimal power. The screen drive mechanism provides a constant offloading of intercepted organic waste into a collection tray beneath. The filter sponges are arranged in 3 grades of coarseness providing excellent particle extraction and biological housing. The waste sensor will detect when there is sufficient waste build up on the screen and engage cleaning cycles automatically. 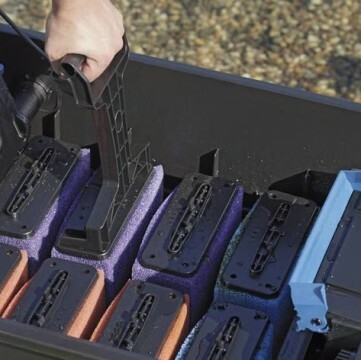 Each filter foam is mounted on a support from which it can be compressed using the supplied cleaning handle. The large collection tray stores solid waste products intercepted by the screen and is easily removed for emptying. The fabric screen belt will intercept particles as small as 300 micron which allows the foam media to perform primarily as biomedia. The supplied cleaning brush enables the screen to be gently cleared of debris without the risk of tear or abrasion. 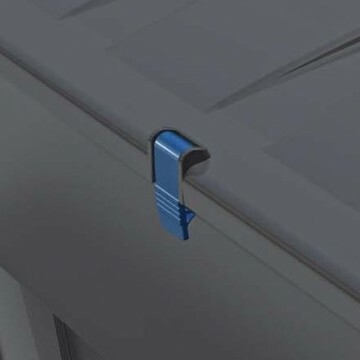 The simple addition of robust locking clips on the lid prevents the lid being unintentionally dislodged or blown off in strong winds. Secondary suction inlet allows a second device such as a surface skimmer or bottom strainer to be run alongside the main pump. 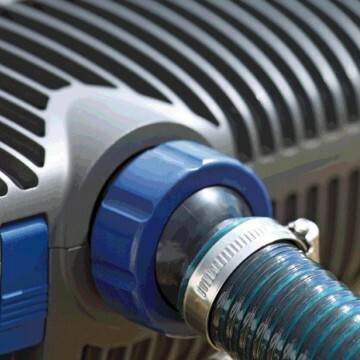 Ball swivel hose connectors allow 360˚ angle rotation of hose tails. Hose tails are multi-staged to suit different diameters of flexible hose pipe. Robust locking clips on all four corners make access to the pump very easy. 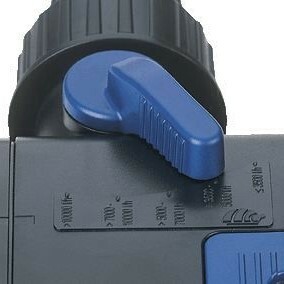 Simply unclip and remove the top casing half to expose the pump. 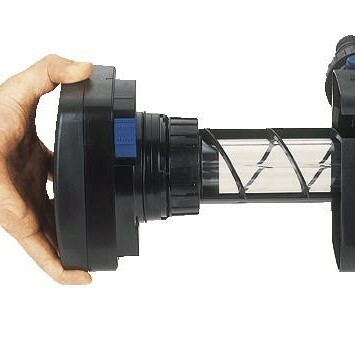 AquaMax Eco Premium pumps can be submerged in water or dry installed below the water level in flooded suction applications. Supplied as part of BioTec ScreenMatic Sets. The AquaMax Eco Premium filter pumps are high performance filtration pumps with Eco Plus motors for excellent output and very low running costs. These advanced filtration pumps are built with technical features and unique functions. With double layered outer strainer for continuous pumping when masked, solids-handling up to 11mm particle size and secondary inlet feature for connecting a strainer or surface skimmer, these pumps are perfect for supplying to flow through filters such as the BioTec ScreenMatic. Technical features include dry run protection via unique Environmental Function Control, this shuts the pump down if it begins to run dry to prevent overheating. The AquaMax Eco Premium pump will then restart in 'test mode' to ensure it is fully flooded before reverting to full output. The pump can be installed in dry scenarios by principle of flooded suction, connecting a pipe to the inlet below water level to provide a continuous flood of water into the pump. Models 12000, 16000 and 20000 also feature a Seasonal Flow Control function which if switched on will automatically reduce the flow of the pump if the water temperature drops very low, ideal for saving energy in Winter. Models 12000, 16000 and 20000 have seasonal flow control adjustment that automatically reduces motor speed in winter. 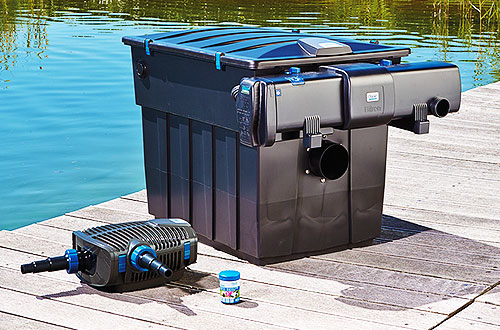 The OASE Bitron C are excellent ultraviolet clarifiers for fish ponds. 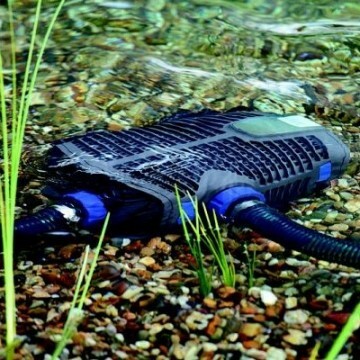 These UV units feature twin outlets for direct connection to OASE filters, flow bypass fuctions to optimise flow over the UV light and spinning cleaning mechanisms that perform continuous rotation generated by the flow from the pump, keep the quartz glass sleeve free of debris and maintaining excellent efficiency from the UV light and clear water in the pond. These UVC units are also built with safety in mind, with a safe viewing window that indicates lamp activeness without direct exposure. There is also a cut out switch built into all Bitron C units that will prevent the lamp from lighting up if the housing and ballast unit are separated. 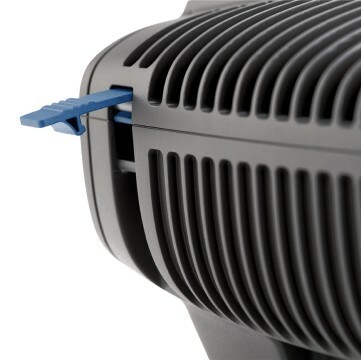 The Bitron C UV all feature a spinning helix that is driven by flow-through. This keeps the quartz glass free of debris for maximum light exposure. 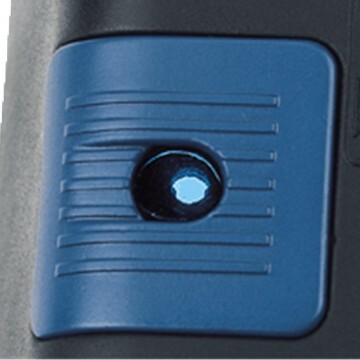 OASE Bitron C have a function window which glows blue when the UV light is active and functional. This allows safe viewing without exposure to the eye. Bitron C Ultraviolet clarifiers all have twin outlets with a flow bypass regulator. This feature allows optimum flow over the light with excess flow bypassing. 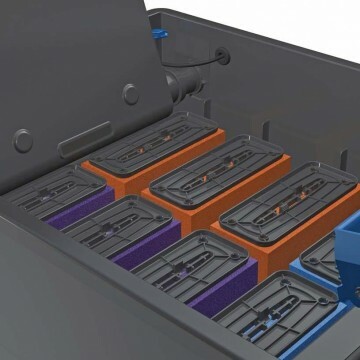 The twin points of outlet on the Bitron C allow them to be secured directly to an OASE filter unit with matching inlets, making the system neat and compact. 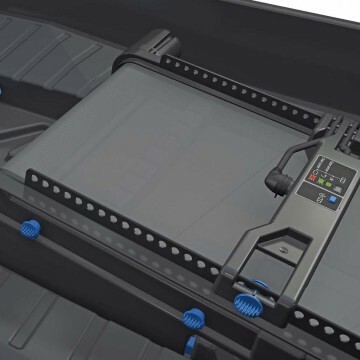 In addition to the automated screen, the new BioTec ScreenMatic2 also features specially developed filter foams which are graded from coarse to fine to remove finer particulates from the pond, resulting in crystal clear water quality. 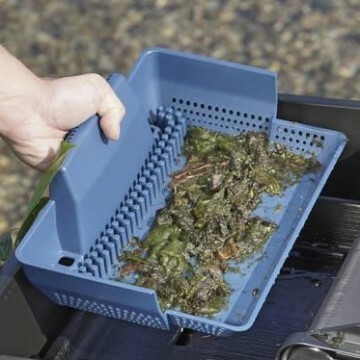 Inside the filter box are a series of Zeolite cartridges for binding trace ammonia and undesirable nutrient which can be recharged using a saltwater solution. 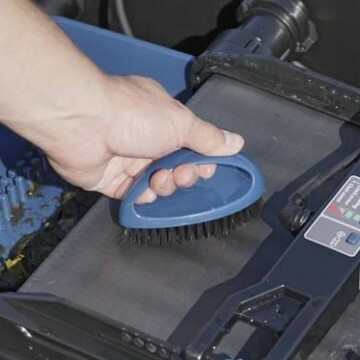 The filter foams are easily cleaned using the supplied cleaning handle which compresses the foams to release trapped debris, without the need to physically handle the sponges. 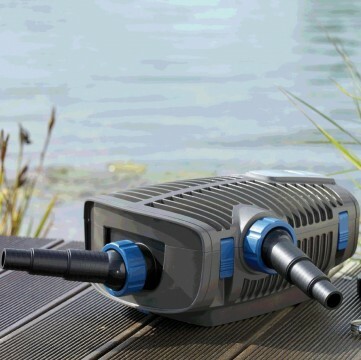 The new BioTec Premium 80000 notches the automated cleaning to a new level, utilising rotating drum technology to automatically remove pond debris and we also supply this as a packaged set with optimised pump and UVC. Water Garden Ltd provide a range of packaged filter systems for the BioTec ScreenMatic, in addition to the individual filter boxes. Packaged Sets include the innovative OASE AquaMax Eco Premium pump and Bitron Ultraviolet Clarifier for superb performance and energy efficiency. 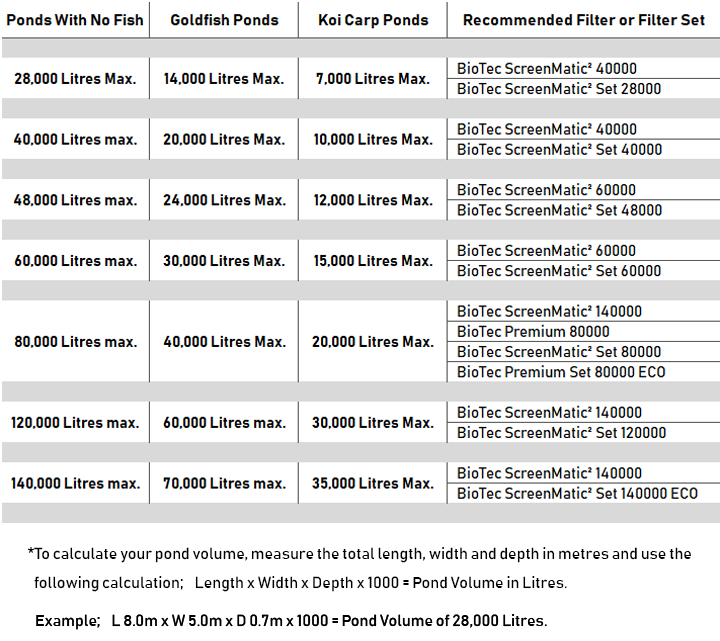 Choosing the right BioTec ScreenMatic² Filter for your pond.